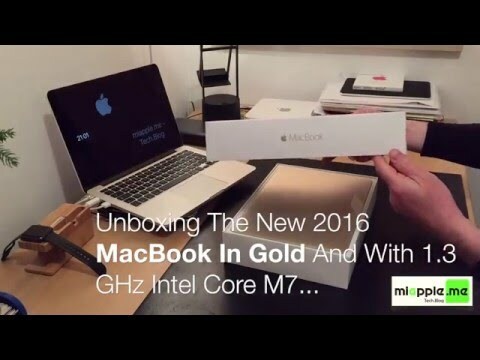 Just arrived, I present the unboxing video of my new 12 inch MacBook (early 2016) in gold and with a 1.3 GHz Dual-Core Intel Core M7 processor (Turbo Boost up to 3,1 GHz). The updated 12 inch MacBook was released on April 19, 2016, almost one year after the introduction of the new MacBook. The updated 12 inch MacBook product line got better processors with less battery consumption meaning up to 10 hours battery life and a faster PCIe-based flash storage. Find more details about the Macbook (early 2016) specs in the following. MacBook features sixth-generation Intel Core m3, m5, and m7 processors, that run on just 5 watts of power, with speeds of up to 1.3 GHz and up to 25 percent faster graphics. 1.3 GHz dual-core Intel Core m7 processor (Turbo Boost up to 3.1 GHz) with 4MB L3 cache. The feeling while unboxing the new MacBook (early 2016) was the best one ever. Also the first working impressions of the new MacBook are gorgeous: Light-weighted (2 lb / 920 g), a new and great keyboard feeling and the processor power (1.3 GHz dual-core Intel Core m7 processor) is sufficient for most tasks (video rendering not tested yet). I really do love this MacBook!